As part of the Minnesota Musical Instrument Drive program, Vega partnered with Victoria, a Girl Scout pursuing her Gold Award, to deliver 50 musical instruments for Hmong College Prep Academy’s incoming sixth grade band members. Victoria brought in her band mates to clean and prepare donated musical instruments, organize donated sheet music, and guide incoming HCPA sixth graders as they tried their hand at playing musical instruments. HCPA’s incoming sixth grade class totaled 90 students, and half wanted to join the HCPA middle school band. Victoria and Vega helped to make that possible. 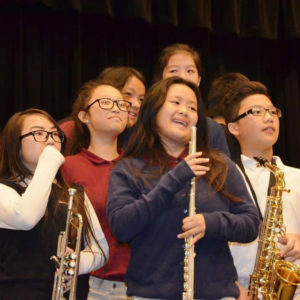 The next year, Vega helped HCPA grow its band program even more, donating about 20 musical instruments to the school, with a little help from UnitedHealth Group. Volunteers from United Health Group delivering donated instruments. How does this go together?! Now we have to learn how to read music.